Intel has a long but uneven history in the embedded market. In the early days of the personal computer Intel released the 80286 as a followon to the original 8086. There actually was an 80186: it was a more integrated version of the 8086 aimed at embedded applications. Intel's interest in embedded markets has waxed and waned over the years, but it is an area where Intel still has room for significant growth. At the Intel Developer Forum next week Intel is expected to focus on embedded applications for its products. 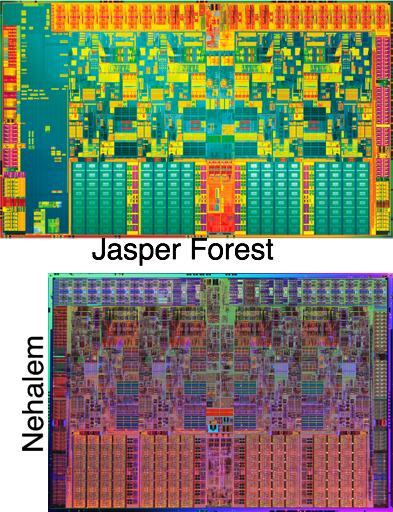 In advance of IDF Intel announced the Jasper Forest CPU, a System on Chip version of Nehalem. It is based on a 1, 2, or 4 core CPU plus an integrated PCI-e controller, so it does not need a separate northbridge chip. Intel also committed to a 7 year production lifetime, allowing the part to be designed into products which will remain on the market for a while. I'd speculate that Intel will offer industrial temperature grade parts as well, perhaps at lower frequencies. Jasper Forest is particularly suited for and aimed at storage applications. It has additional hardware for RAID support (presumably XOR & ECC generation), and a feature to use main memory as a nonvolatile buffer cache. When loss of power is detected the chip will flush any pending writes out to RAM and then set the DRAM to self-refresh before shutting down. By including a battery sufficient to power the DRAM, the system can avoid the need for a separate nonvolatile data buffer like SRAM. This is a good approach for Intel: target silicon at specific high margin, growing application areas. Go for markets with moderate power consumption requirements, as x86 is clearly not ready for small battery powered applications like phones. Ars Technica discusses Intel's upcoming weapon for getting into mobile and other battery powered markets, a version of their 32nm process which reduces leakage current to almost nothing. 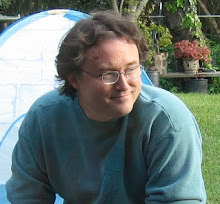 An idle x86 would consume essentially no power, which would be huge.